Draft: 2003, Anaheim Angels, 18th rd. Full name is Fernando Rodriguez Jr. Signed by Kevin Ham (Angels). Signed by LAA out of Franklin High School in El Paso. Spent most of the season with the Cubs' Triple-A Iowa affiliate before being signed by BOS as a minor league free agent on 8/17...Signed by the Cubs as a minor league free agent on 1/19 with an invite to ML Spring Training. Began the season on the disabled list with a right shoulder strain. Returned from the DL on 6/10 and appeared in 9 games with Iowa, posting a 3.09 ERA (4 ER/11.2 IP) with a .205 opponent AVG. Released by the Cubs on 7/17. Signed by BOS on 8/17 and was placed on the DL that day with a right shoulder strain. Pitched in 2 games for the Rookie-level Gulf Coast League Red Sox as part of a rehab assignment (3.0 IP, R). Went 2-0 with a 4.20 ERA (19 ER/40.2 IP) in 34 relief outings with Oakland before his season was cut short due to injury ... was placed on the disabled list, July 4, with a right shoulder strain, ending his season...Was 2-0 with a 1.87 ERA (7 ER/33.2 IP) in his first 26 outings with the Athletics through June 14, striking out 33 batters and walking just 11 ... however, from June 16 through July 3, he posted a 15.43 ERA (12 ER/7.0 IP)...Made his final appearance of the season, July 3 vs. Pittsburgh, facing just one batter. Started the year at Triple-A Nashville and logged a 2.81 ERA and .143 opponents batting average in 10 games before he was promoted to Oakland May 7…spent the balance of the season with the A's and went 4-2 with a 3.84 ERA and .200 opponents batting average in 56 relief appearances…the ERA and opponents batting average were the best of his three full seasons in the majors…the four wins were a career high…struck out 65 batters in 58.2 innings (9.97 per nine innings) and now has 205 strikeouts in 191.0 career innings (9.66 per nine innings)…allowed 4-of-30 (13.3%) inherited runners to score, which tied for the lowest percentage in the American League (Cedeno, TB), ranked second in the majors (Strickland, SF 12.9%) and was the fifth lowest mark by an Athletic since 1974…has allowed just 22- of-111 (19.8%) to score in his career…first batters faced were 7-for-53 (.132) with just three walks… ranked third in the AL in opponents on-base percentage against first batters (.179), fifth in slugging percentage (.189) and tied for fifth in batting average…now has a .177 (28-for-158) career average against first batters…his .200 opponents batting average included a .174 (15-for-86) mark against left-handed hitters and .217 (28-for-129) with all four of his home runs against right-handers…had a .198 slugging percentage against lefties, .380 against righties…yielded a .193 average with runners in scoring position…surrendered just four home runs, but all came with runners on base…had a 2.92 ERA in 12 outings on no days rest compared to 4.08 in his other 44 appearances…compiled a 2.13 ERA in 24 games during the day, a 5.13 ERA in 32 games at night…posted a 2.85 ERA in 45 outings against AL competition compared to a 7.94 ERA in 11 interleague games…tossed fewer than one inning in 19 of his 56 appearances and more than one inning 15 times. Appeared in seven games over two stints with the A's after missing the 2013 season following Tommy John surgery…had a win, a 1.00 ERA and .129 opponents batting average…left-handed hitters were 1-for-11 (.091) with his only extra base hit (double) and both of his walks…righties went 3-for-20 (.150)…allowed 1-of-4 (25.0%) inherited runners to score and first batters faced were 2-for-7 (.286)… did not allow a run in four games in Oakland (4.0 ip) or five outings at night (6.1 ip)…began the season on the disabled list as he continued his recovery from his March 27, 2013 Tommy John surgery…was placed on the 15-day DL March 29 retroactive to March 21…was sent to Triple-A Sacramento on a rehab assignment April 3 and pitched in eight games before he was reinstated from the DL and optioned to Sacramento April 29…was recalled May 9 and made his A's debut that day against Washington (1.0 ip, 1 h, 1 so)…it was his first Major League appearance since Oct. 3, 2012 at Chicago (NL)…was credited with his only win May 31 against Los Angeles (AL) when he tossed a scoreless seventh inning… did not allow a run in five of his six games during first stint and had a 1.13 ERA and .143 opponents batting average when he was optioned to Sacramento June 1…returned to Oakland Sept. 1 when rosters expanded and pitched once on Sept. 16 against Texas, retiring the side in order in the ninth inning… went 3-0 with a 1.97 ERA in 38 relief appearances with Sacramento…struck out 53 in 45.2 innings, an average of 10.45 per nine innings…walked just 16 for a strikeout-to-walk ratio of 3.31…surrendered two home runs, an average of 0.39 per nine innings…allowed a .235 opponents batting average, which included a .189 mark against left-handed hitters compared to .271 against right-handers…both of his home runs were solo shots against righties…opponents hit .154 when leading of an inning…allowed 6-of-8 (75.0%) inherited runners to score…compiled a 1.33 ERA in 17 games at home, a 2.49 ERA with both of his home runs in 21 outings on the road…tossed at least 1.0 inning in 36 of his 38 appearances, including a season-high 2.0 innings five times…began his rehab assignment April 3 and posted a 1.04 ERA in eight games before he was reinstated from the DL and optioned to Sacramento April 29…had a 0.73 ERA and .217 opponents batting average in 11 appearances before he was promoted to Oakland May 9…did not allow a run over his final 9.1 innings before his promotion…returned June 3 and compiled a 2.43 ERA over his final 27 appearances…struck out a season-high tying three batters twice over a three-game stretch: June 16 against Iowa and June 24 at New Orleans…did not surrender a home run over his first 22 games and 28.0 innings through July 13…then allowed two over his final 16 games and 17.2 innings…tossed a season-high tying 2.0 scoreless innings in the second game of a doubleheader at Tacoma July 26 for his second win of the season…did not allow a run in 10 of his 11 August appearances for a 0.82 ERA…struck out 16 batters in 11.0 innings (13.10 per nine innings)…fanned a season-high tying three batters in his final outing Aug. 30 against Reno and picked up the win. Was acquired from Houston Feb. 4 and posted a 10.13 ERA in four spring training appearances before going on the disabled list March 23 with a sprained right elbow…underwent successful UCL reconstruction surgery on the elbow March 27 and missed the remainder of the season…the procedure was performed by Dr. Thomas Mehlhoff at the Texas Orthopedic Hospital in Houston, Texas. Spent the entire season in Houston's bullpen...ranked second on the club in appearances and led all Astros relievers in strikeouts (78)...set career-highs in innings pitched, strikeouts and appearances...ranked fifth in the Majors and third in the National League with 56 inherited runners...allowed 14 of those runners to score (25.0%)...from the beginning of the season until July 2, had allowed just one of his 18 inherited runners to score in 33 games, and led the NL in inherited runners scored percentage (5.6%)...tossed a career-high 4.1 innings Sept. 24 against St. Louis (72 pitches)...that outing bested his previous career high of 3.1 innings which he set Sept. 21 against Pittsburgh (41 pitches)...posted a 3.38 ERA with 22 strikeouts and six walks over his final 12 appearances of the season...from July 27 through the end of the season, ranked tied for third in strikeouts among NL relievers (41). In his first extended Major League action, fanned 57 hitters in 52.1 innings pitched over 47 relief appearances...stranded18 of 21 inherited runners...his 63 combined appearances between MLB and the minors marked a career high...had two stintswith Houston...began the year as an NRI at Astros Spring Training before being assigned to Triple A Oklahoma City...purchasedon May 18 and optioned back on June 24...recalled from Triple A on July 5 and finished the season with Houston...had a 26-game run from June 11-Aug. 17, during which he posted a 1-1 record and a 2.25 ERA (7ER/28IP)...on June 24 vs. TB, appeared inthe same game with Wandy Rodriguez and Aneury Rodriguez...according to Elias, this marked the first game in the modern era(since 1900) that a trio of teammates with the same surname pitched in the same game...went 2-3 with two saves and a 1.50 ERA(4ER/24IP) in 16 games for Oklahoma City...allowed just a .190 opponents batting average. Spent the entire season at Triple A Salt Lake, where he went 4-6 with a 5.92 ERA (64ER/97.1IP) in 31 games (17 starts)...posted comparable numbers as a reliever (5.75 ERA) and starter (5.96 ERA)...started and finished his season in the bullpen,bookending 16 of his starts from May 30-Aug. 30...began the year on the Angels 40-man roster before being designated forassignment and eventually outrighted to Salt Lake on May 11...following the season, pitched for the Tiburones de La Guaira inthe Venezuelan Winter League for the second straight season... posted solid numbers as a full-time reliever, going 4-2 with a2.82 ERA (7ER/22.1IP) in 20 appearances. Began season at triple-A Salt Lake, posting a 1-1 record and a 7.54 ERA (37 IP - 31 ER) in 23 relief appearances...Allowed 44 hits (5 HR), walked 23 and struck out 25...Marked first season as a reliever as he was primarily astarter over previous five seasons...Had contract selected by Angels, April 26...Made Major League debut, May2 at New York (0.2 IP, 1 H, 3 R, 2 ER, 2 BB, 1 SO, 1 HR)...Optioned to Salt Lake, May 4...Made last appearance atSalt Lake, June 26 before being sent to double-A Arkansas where he posted a 3-1 record with four saves and a1.28 ERA (42.1 IP - 6 ER) in 26 relief appearances...Allowed 20 hits (0 HR), walked 22 and struck out 52...Nineof final 10 outings were scoreless (15 IP). In 2008, spent entire season at double-A Arkansas, posting a 7-11 record with one shutout and a 5.53 ERA(136.2 IP - 84 ER) in 22 starts...Tossed complete game shutout and struck out eight, May 17. In 2007, compiled an 8-4 record with one complete game and a 4.52 ERA (125.1 IP - 63 ER) in 22 starts atArkansas...Won four straight decisions from June 14 to July 25...Held right-handed batters to a .255 average. In 2006, posted n 11-8 record with one complete game and a 4.57 ERA (163.1 IP - 83 ER) in 28 games, 27starts, at Rancho Cucamonga...Led California League in innings pitched and tied for third with 11 wins. In 2004, went 4-3 with a 4.14 ERA (58.2 IP - 27 ER) in 14 games, 12 starts at Provo...Led Provo in inningspitched and strikeouts (54). Began his professional career for the Angels Arizona Summer League affiliate...made 15 apearances before a promotion to Provo in the rookie-level Pioneer League...combined to post an 0-2 record and a5.52 ERA (19ER/31IP) at his two stops. February 23, 2019 RHP Fernando Rodriguez Jr. assigned to San Diego Padres. January 23, 2019 RHP Fernando Rodriguez Jr. assigned to El Paso Chihuahuas. January 22, 2019 San Diego Padres signed free agent RHP Fernando Rodriguez Jr. to a minor league contract. November 2, 2018 RHP Fernando Rodriguez Jr. elected free agency. May 15, 2018 Pawtucket Red Sox activated RHP Fernando Rodriguez Jr. from the 7-day disabled list. April 10, 2018 Pawtucket Red Sox placed RHP Fernando Rodriguez Jr. on the 7-day disabled list retroactive to April 9, 2018. Right hamstring strain. April 4, 2018 RHP Fernando Rodriguez Jr. assigned to Pawtucket Red Sox from Portland Sea Dogs. 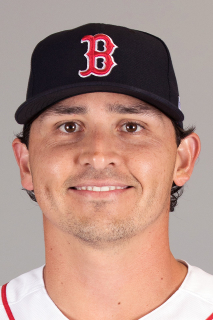 January 16, 2018 Boston Red Sox invited non-roster RHP Fernando Rodriguez Jr. to spring training. September 27, 2017 Portland Sea Dogs activated RHP Fernando Rodriguez Jr. from the 7-day disabled list. August 29, 2017 RHP Fernando Rodriguez assigned to Portland Sea Dogs. August 29, 2017 sent RHP Fernando Rodriguez on a rehab assignment to GCL Red Sox. August 17, 2017 Boston Red Sox signed free agent RHP Fernando Rodriguez to a minor league contract. July 17, 2017 Iowa Cubs released RHP Fernando Rodriguez. June 10, 2017 Iowa Cubs activated RHP Fernando Rodriguez from the 7-day disabled list. April 6, 2017 Iowa Cubs placed RHP Fernando Rodriguez on the 7-day disabled list. January 27, 2017 RHP Fernando Rodriguez assigned to Iowa Cubs. December 24, 2016 Chicago Cubs signed free agent RHP Fernando Rodriguez to a minor league contract and invited him to spring training. October 7, 2016 RHP Fernando Rodriguez elected free agency. October 6, 2016 Oakland Athletics sent RHP Fernando Rodriguez outright to Nashville Sounds. May 7, 2015 Oakland Athletics selected the contract of RHP Fernando Rodriguez from Nashville Sounds. December 23, 2014 Oakland Athletics sent RHP Fernando Rodriguez outright to Nashville Sounds. December 18, 2014 Oakland Athletics designated Fernando Rodriguez for assignment. October 2, 2014 Oakland Athletics activated RHP Fernando Rodriguez. September 30, 2014 Oakland Athletics reassigned RHP Fernando Rodriguez to the minor leagues. September 1, 2014 Oakland Athletics recalled RHP Fernando Rodriguez from Sacramento River Cats. June 1, 2014 Oakland Athletics optioned RHP Fernando Rodriguez to Sacramento River Cats. May 9, 2014 Oakland Athletics recalled Fernando Rodriguez from Sacramento River Cats. April 29, 2014 Oakland Athletics optioned RHP Fernando Rodriguez to Sacramento River Cats. March 31, 2014 Oakland Athletics sent RHP Fernando Rodriguez on a rehab assignment to Sacramento River Cats. November 4, 2013 Oakland Athletics activated RHP Fernando Rodriguez from the 60-day disabled list. March 23, 2013 Oakland Athletics placed RHP Fernando Rodriguez on the 60-day disabled list. Sprained right elbow. July 5, 2011 Houston Astros recalled Fernando Rodriguez from Oklahoma City RedHawks. June 25, 2011 Houston Astros optioned Fernando Rodriguez to Oklahoma City RedHawks. May 18, 2011 Houston Astros selected the contract of Fernando Rodriguez from Oklahoma City RedHawks. November 12, 2010 Houston Astros invited non-roster RHP Fernando Rodriguez to spring training. November 10, 2010 Oklahoma City RedHawks signed free agent Fernando Rodriguez. November 6, 2010 RHP Fernando Rodriguez elected free agency. October 20, 2010 RHP Fernando Rodriguez assigned to Tiburones de La Guaira. May 11, 2010 Los Angeles Angels sent Fernando Rodriguez outright to Salt Lake Bees. May 11, 2010 Salt Lake Bees activated RHP Fernando Rodriguez from the temporarily inactive list. May 11, 2010 Fernando Rodriguez roster status changed by Salt Lake Bees. May 7, 2010 Los Angeles Angels designated RHP Fernando Rodriguez for assignment. March 16, 2010 Los Angeles Angels optioned Fernando Rodriguez to Salt Lake Bees. October 29, 2009 RHP Fernando Rodriguez assigned to Tiburones de La Guaira. October 26, 2009 Fernando Rodriguez roster status changed by Los Angeles Angels. June 27, 2009 Fernando Rodriguez assigned to Arkansas Travelers from Salt Lake Bees. May 4, 2009 Los Angeles Angels optioned Fernando Rodriguez to Salt Lake Bees. April 26, 2009 Los Angeles Angels selected the contract of Fernando Rodriguez from Salt Lake Bees.